Day three of Paris Air Show 2013 Le Bourget was packed with exciting Boeing order announcements. The majority of these orders comprise the 737. Travel Service today announced a commitment for three 737 MAX 8s. Based in the Czech Republic, Travel Service offers charter flights to more than 230 airports on four continents, as well as low-cost scheduled service to major European destinations through its Smart Wings brand. Travel Service currently operates 28 Boeing 737s. Its fleet combines airplanes bought directly from Boeing as well as leased airplanes. Oman Air announced an order for five Boeing Next-Generation 737-900ER airplanes. With this order, Oman Air becomes the first customer in the Arabian Gulf region to order 737-900ERs. Currently, the airline operates a fleet of 15 Boeing Next-Generation 737-800s and two 737-700s. 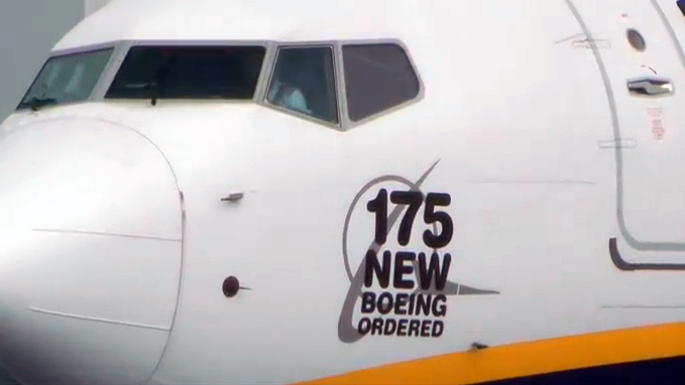 With this new order, the airline now has a backlog of six 737-800s and five 737-900ERs. In addition, Oman Air has six Boeing 787-8s on order. European low-cost carrier Ryanair today finalized a firm order for 175 Next-Generation 737-800 airplanes. The order, originally announced as a commitment in March, is Boeing’s largest ever aircraft order from a European airline. At a signing ceremony today at the 2013 Paris Air Show, Michael O’Leary, president and CEO of Ryanair, joined Ray Conner, Boeing Commercial Airplanes president and CEO, to finalize the historic deal. O’Leary flew into the air show on one of Ryanair’s 303 737-800s, which bore a special livery celebrating the agreement. CIT Group today announced that CIT Aerospace has placed an order for 30 737 MAX 8s. As of March 31, 2013, CIT owned or financed a fleet of approximately 350 commercial aircraft, including operating lease and financing agreements in place for 128 Boeing aircraft. Korean Air has agreed to purchase five 747-8 Intercontinental airplanes and six 777-300ER (Extended Range) jetliners. Korean Air is the only airline in the world to order both the passenger and freighter variations of the 747-8. Korea’s flag carrier will have 10 747-8 Intercontinental airplanes on order. The airline has taken delivery of three of its seven 747-8 Freighters on order. Korean Air currently operates a fleet of 90 Boeing passenger airplanes that consist of 737, 747 and 777 airplanes. The airline also operates an all-Boeing cargo fleet of 27 747-400, 747-8 and 777 Freighters. In February 2012, Korean Air became the first airline in the world to operate both the 747-8 and 777 Freighters.